Diamond bespokejewellery is expensive, and ending up with a fake one is indeed expensive. If you are in doubt if the stone you have is real or fake, there are tests you can do at home to tell you more or less. Ultimately, you will have to go to a jeweller or a gemologist to be sure. There are gems out there that are manufactured to simulate diamond like moissanite and cubic zirconia. It’s difficult to tell the real thing from these gems, so a trip to the gemologist is the only way. But these at-home tests should help you determine which are likely fake and which are real. Hold the diamond close to your mouth and breathe into it as you would to fog up a mirror. A real diamond will disperse heat quickly and should instantly go back to its clear shine.Do this test on a cubic zirconia, and it will continually to be foggy.The breath test will not work on a moissanite though, so be aware. If you happen to have a jeweller’s loupe on hand, you can do this test to determine if you have a real diamond, a fake, or just a low-grade one. Most real diamonds possess some form of imperfection or flaw in them called inclusions. If you inspect them under magnification, you might find a white spot that resembles a feather or a small portion of carbon inside. 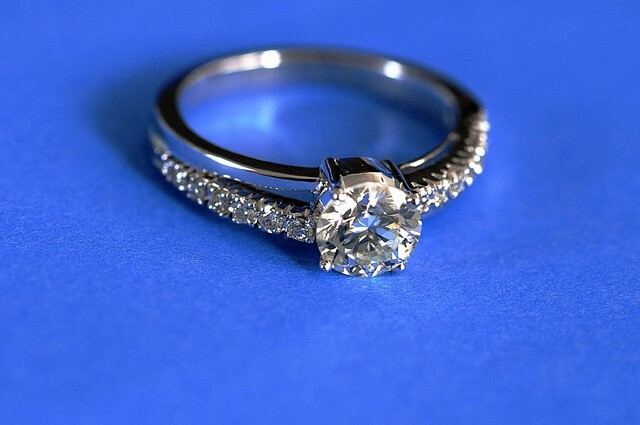 Moissanite, cubic zirconia or other forms of synthetic diamonds don’t have these since they are manufactured to be flawless.But don’t be quick to judge because you might just have in your hands a rare internallyunblemished diamond. This test works best if you have a loose stone. Take your diamond and try to scratch a piece of glass with it. Being ranked hardest on the Mohs scale, a real diamond should leave a visible scratch on the glass. If it doesn’t leave a mark on the glass, then most likely you have a fake. Be careful with this test though because it is still possible to chip a diamond.It’s also good to note that there are some synthetic forms of diamonds also scratch glass so you are still not in the clear. This test works well on gems that are on the larger end. Take your stone and place it over a piece of finely printed newspaper. If you have a real diamond, you shouldn’t be able to read the print underneath. Real diamonds refract light in a way that they won’t allow you to see through them. If you have, say, a cubic zirconium in your hands, you should see the print underneath clearly. Due to its density, a real diamond should sink to the bottom when dropped in a glass of water. A diamond simulant on the other hand will tend to float. These at-home tests should help you figure out if your diamond custom engagement rings is indeed a real one-of-a-kind jewellery or simply a fake one. However, to be completely sure, always consult with a certified gemologist or jeweller. For more than ten years, Daniel Greenberg has been hand crafting DG Bespoke Jewellery and is known as a trained master diamond mounter and goldsmith. As he was taught by one of the best jewellers in London (his father), Daniel makes certain that all his unique pieces are pure perfection.